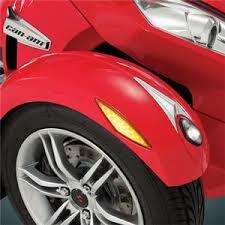 Big Bike Parts® adds safety to the Can Am Spyder with a contoured Amber LED Marker Light to replace the reflector. This marker light is thicker than OEM and contoured to better match the lines of the front fender and can be wired as either running or running and turnsignal. With 16 LED’s per side safety is markedly improved by being more visible and putting a turnsignal on the side. For original style Can Am Spyder front fenders. Sold as a pair.